Coffee is really an around beverage. It can be served with anything including meals anytime of the day, snacks, and after a drinking session (ehem!). 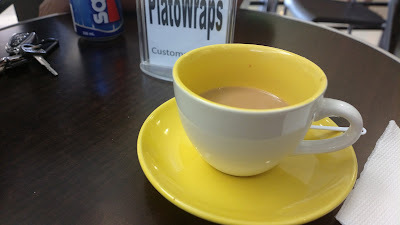 So even a homemade style coffee from Plato Wraps is my universal drink I pair with all sorts of merienda food at an SM mall including siomai, takoyaki, kakanin, 49ers merienda, and an actual lunch meal.